The second part of Upper Deck's signature card set hit the hobby world this week! This set usually fills in all the gaps and cleans up all the loose ends that Series 1 left behind. This set certainly does that... and a whole lot more. Not only does it finish UD1... but also Victory, MVP, and OPC as well. Let's check out the mash of cards that is UD2. The base cards in UD2 are exactly the same design as in the first series so there is no need to go into detail about what's here. I will say that it was a great pleasure to browse through the set once again though. Upper Deck has chosen to represent the NHL in eye popping, high quality photographs. 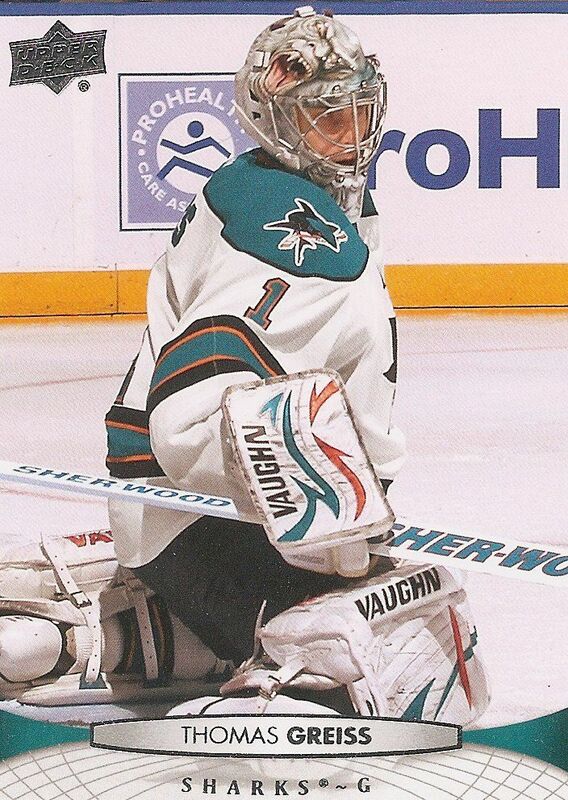 I loved seeing many of the players that have gotten more frequent playing time on their teams such as San Jose backup net minder Thomas Greiss, as well as players that have been traded to other teams in their new colors. Upper Deck has done a very nice job of tidying up. Now it's not all perfect though... the NHL trade deadline obviously came after the checklist of this set was finalized so there are some players who are not currently up to date. One example is Dominic Moore. 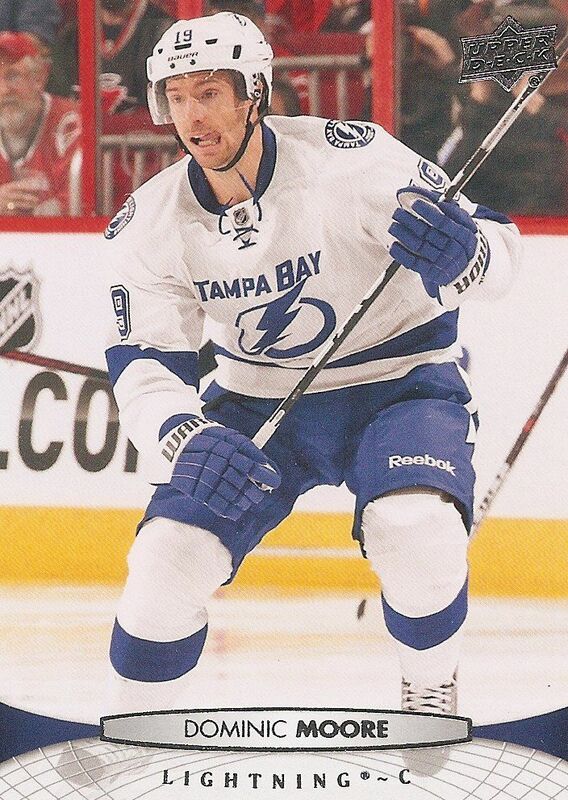 He is card number 285 and is shown in his Tampa Bay uniform - not his newly acquired Shark's one. Also, Cody Hodgson, one of the biggest rookies in this year's product is not to be found in his new Sabres jersey. But of course it's hard to fault Upper Deck too much for this. I'm just glad we have an Upper Deck product out! Seems like many from the Upper Deck line of cards have been delayed. The Young Guns share the same design as before so I won't re-review them. The base cards and the Young Guns score the same rating as they did when they were released last year. In case you don't remember what I thought, or don't want to search for the UD1 review, here are a few things that I was critical about regarding this year's set of cards. - The 'globe' design at the bottom of the base card seems a bit recycled from an earlier Upper Deck release. - Some of the base card backs left a lot of space that could have been used more effectively. - The Young Gun design seemed a bit muted this year. Much can be found in each box of Upper Deck Series 2. In fact, I don't think there was a single pack that only had UD2 base cards within it. Upper Deck has loaded up boxes with insert cards ranging from updates to jerseys to autographs. Most of the inserts in packs are updates to O-Pee-Chee, MVP, and Victory. In year's past UD2 had always put Victory Update cards in to round out the Victory rookie cards. This year Upper Deck has stuffed even more sets in. I have already reviewed all three of the sets mentioned, so please check back and re-read my reviews of them if you like. I would like to mention, however, that I am very, very happy to see the MVP rookie cards here in Series 2. MVP was an insert into Victory boxes this year and I thought that Upper Deck wasn't going to have the cards continued on. To my surprise, they showed up in UD2. Not only are there the standard base cards, but the beautiful black bordered rookie cards are here. 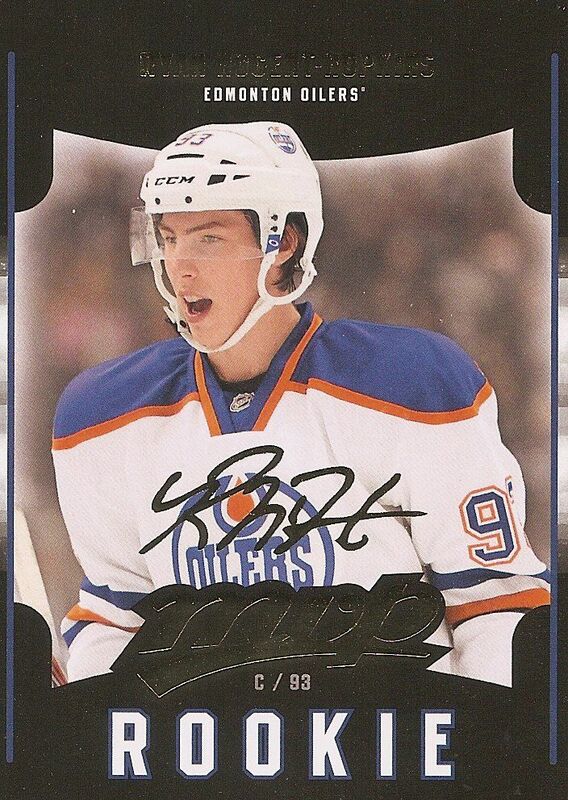 I was crossing my fingers for a Ryan Nugent-Hopkins MVP rookie... and it's here! Kudos for the inclusion Upper Deck! To go along with these sets, collectors can also find inserts from OPC and MVP as well. OPC retro cards are in the boxes as well as autographed MVP inserts. Each box of Series 2 will contain two jersey cards on average. In Series 1 collectors usually found two UD Game Jersey insert cards. Here, they will find one of those and also a Rookie Materials jersey card. These cards have been a staple of UD2 for some time now and again they are back this year. 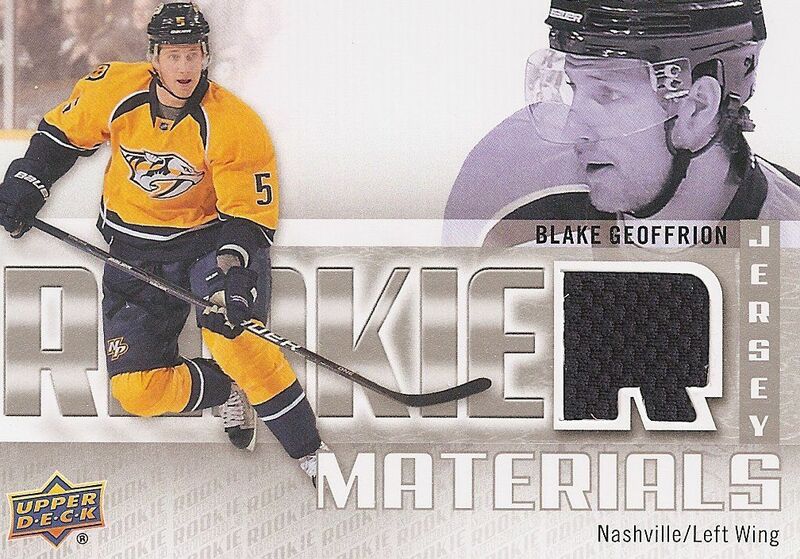 The Rookie Materials cards have a horizontal orientation with a jersey swatch in the shape of an 'R'. It's not a bad design, but it's not a card that I particularly find appealing either. These rookie jersey pieces are stated to have come from the rookie photo shoot. Fans of the rookies will definitely want to pick one of these up just to have as a part of their PC, but otherwise they shouldn't be too appealing to most collectors. Rookie Breakouts also make a return to UD2. These acetate cards are limited to only 100 copies each. I appreciate these cards because they add a different element to the set. I am very happy to see that there are less inserts like the All World Team in this release. I guess those spots were taken by the updated cards. To find out all the details about what exactly is in UD2, Upper Deck has released all the information you could ever want regarding it. This is not a typical Upper Deck practice, but I'm very happy to see that they did. Click here for a run-down of Series 2 and all it's secrets! Because of all the different elements put into UD2, this series actually gets a higher rating from me than the first. Upper Deck Series 2 is a great product to sit down and open. The word is definitely 'fun'. I loved seeing all the different things that the box had to offer. For collectors who like variety, this is a product that will keep you occupied! In terms of value, I see that there are some great positives. 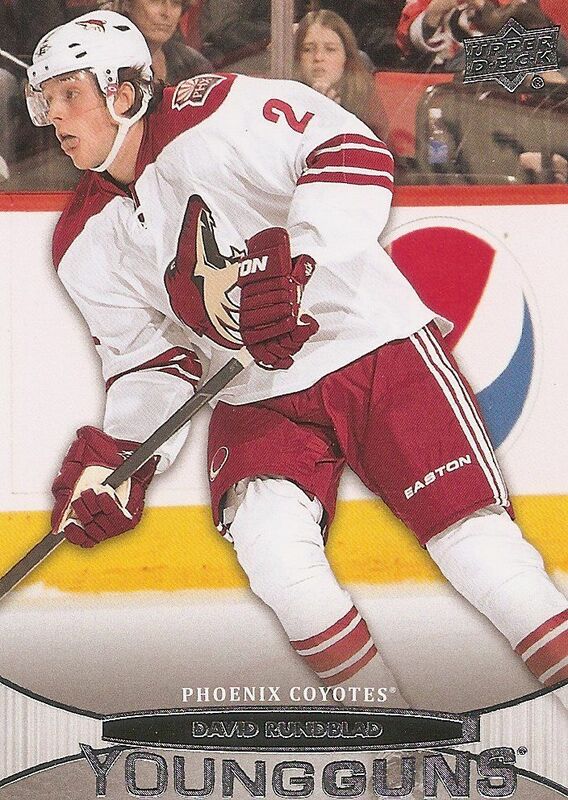 As usual, the Young Gun rookie cards should prove very popular. The group of Young Guns in Series 2 may not be well known, but you never know when one will break out and be a star. Also, the Victory, MVP, and OPC rookie cards will still yield all the big names from the first series so there is definitely some added value there in terms of rookie cards. Last year Upper Deck did not produce a lot of Series 2. Boxes of last year's product is very hard to find and expensive if you find it. I'm not sure about this year's production run, but I would go out and get a few boxes just in case! Over, under, or just-rightly produced... this is a product I would recommend busting into. I think UDS2 is overall a good product for this year (11-12). The base cards as usual have vewry nice photography. I would love to see some more foil on the cards to make it stand out a bit better like Artifacts. I don't think the globe theme in the Young Guns or base cards appeal and attract people. I like how they add MVP, Opeechee and Victory cards in this product. 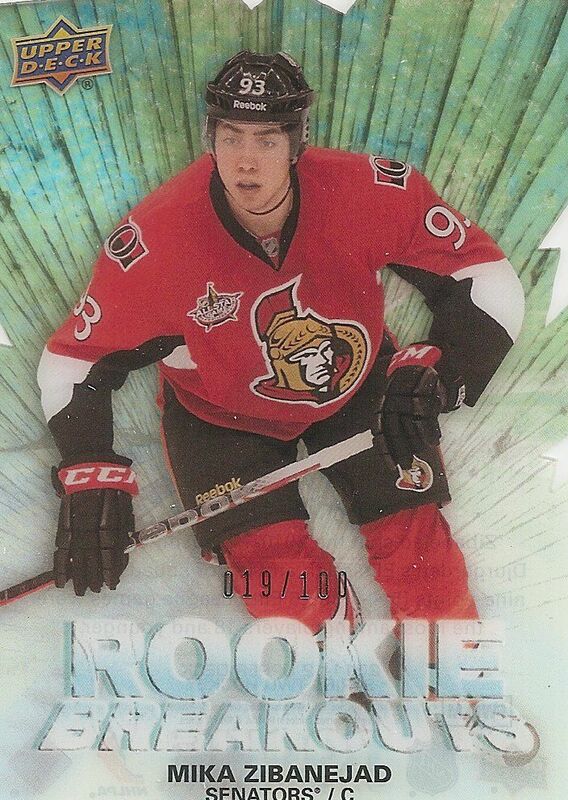 The Rookie Breakouts are by far the best cards in this product. The acetate touch on the cards is really unique. I dislike the Rookie Materials this year because the game used jersey is placed at the end of the word 'Rookie.' It makes it look like it is spelled 'Rookier' which I believe is not a word. :P In conclusion, I rate this product as 8.5/10. I'd rather buy singles out of this product as the young guns aren't as great as the first series. I realy like this product. i think upper deck did a very good job in putting this together. the rookie materials are extreamly nice cards. I always thought that UDS1 was superior to UDS2, just because the YG's in S2 are always much worse. However, there's a lot of extra stuff that you can get in S2, and I'm pretty impressed with it so far this year. like the base cards from S1 and S2. Also it looks like there are tons of different inserts in series 2. of what i saw, my favorite is MVP. congrats on getting the Hopkins Mvp rookie. I gotta get some packs of this. I love series 2 every year, this year is no exception with its loaded hits and great looking cards! Thanks for the contest Luke! Upper Deck Series 2 (in my opinion) gives collectors great value. What I like about this years product is that MVP, OPC AND Victory are also inserted into the packs, and from what I seen, you really don't get an all "base" pack which is great. Although the Young Guns crop isn't as good compared to Series 1, you still get a chance at the RNH, Henrique, Hodgson, etc rookies. Overall, Series 2 delivers and makes for a sweet product. Nice review as always! Love UDS1 and 2 in past years and now, always fun to break, and this "UDS2" i find is the best yet, hope to get a box soon. Series 2 Is Definatley a Great product, I love this years look of the Rookie Materials, To bad they book pretty low... but love to see them this year! I seem to never really purchase that much Upper Deck Series 2. Maybe because the best Young Guns are usually in Series 1. I understand that you can pull some nice stuff like rookie jerseys and programme of excellence canvas cards, but I don't really prefer UDS2 this year. Seems like there isn't a super good rookie from the list that stands out to me right now. I do however like the idea of putting MVP into the product as that is one of my favourite products of all time. Those one on one MVP autographs would be nice to pull though :) I might try a few packs of this product, but overall I'm not too much of a fan to be honest. I'd rate this product a 7/10 from what I've seen so far. Thanks for the contest BlackSheep!! Ive always liked the Upper Deck Series set. Ive always been a set collector and this is one that I always pick up every year. the inserts are nice but sometimes to infrequent for my taste. Other than that great product and good price!!! I'm always biased towards whichever release has my PC players. Last year, one was released in S1, and the other in S2. This year though, while my main guy had jerseys in S1, both PC players have base and the parallels in S2. Thus, my bias lies there. Not to take away anything from the set though. The inclusion of update sets, while a little much, is a nice touch; as well, some of the case hits (Rookie Breakouts, the UD Signatures and MVP autos, patches, etc) are excellent, and there's always the thrill of finding that Exclusives, or the big Young Guns. I didn't give S1 a try (minus a group break), but I may have to do more so for S2. This years UD Series have been outstanding! When Series 1 came out, it sold like crazy, and people were all hoping for a 'Nuge pull! This UD Series 2 does have the biggest names, but they made up for it by adding OPC, and Victory cards. You can't go wrong with buying a box of this! In my opinion, this years UD Series 2 is better than last years. I would have to agree with your rating luke, 9/10. Thanks again for another great review and contest! You always seem to have the good hand when opening all your boxes, because you pulled a Nugent-Hopkins MVP RC. The checklist in my opinion was pretty good with Johansen, Smith, Nyquist, Miele, and etc. I like the Canvas cards a lot since they made subsets within them like PoE and the Retired Legends ones. I like how you can pull the best of both worlds with rookies from S1 and the Rookie YGs from S2. Great review as always! Upper Deck did such a great job this year on the card designs that i decided to do the base set and the YG set!, I absolutely love the photography of the base set. UD always has the best pictures in my opinion. For me opening S2, was probably the most fun I had opening a product this year. I love how you get atleast something in every pack and also how the big name rookies aren't as hard to get because they have so many rookie cards in this set. Overall an amazing product for the price point! I love series2 this year. It almost plays out like 05-06 rookie update with all of the different sets in the packs. However, this can all get very confusing. Also, as a Ranger fan I feel like Hagelin and Bickel should have gotten more than just young guns, and that tim erixon should have gotten more than just a victory rookie, but I am biased. Really liked Series 1, and 2 is really no different so it's good in my books as well. I don't really like getting all those victory and OPC updates with series 2, even a more limited amount would have been better. Also, I've always thought the die-cut R in the rookie materials didn't look very good, even just a square would be better. Still a very solid release, I'll still buy a box. Great review! Can't believe you pulled two RNH cards. Oh yeah, and the contest ends on my birthday so hopefully that's good luck! I really like this years sieres 2, like how they added the mvp and o pee chee cards. I love this years seires two. Like the look of the cards. Also I am I fan of myp and o pee chee inserts. Nice stuff this year. I think the the UD series 2 set was decent. I am not a huge fan of the additions of victory, opc, and mvp but i guess it will be okay. I wish there were more Winnipeg Jets cards in Series 2. In addition, I think they should have early season highlights cards, as well as randomly inserted Jeremy Lin cards! I love the Series 2 product this year! First of all, it has Zack Kassian in it, that satisfies me enough :P But I do love the mix of Victory, OPC and MVP rookies in this product. It just seems to make the breaks more fun because there are so many more hits! Thanks for the contest! I really like the product this year and think that all of the update versions are very cool! I cant wait to get my hands on a box or two of this stuff! Nice product, always look forward to seeing the new stuff and the update sets. UD Series 2 is a nice product, but I hate what they did by putting victory and OPC cards. that's the only thing I don't like in UD Series 2. The rest is pretty good. P.S. I didn't right a lot because my last comment did not show up. not a fan of series 2 only because you get a bunch of victory rookies, random inserts and most likely series 2 ygs are well crsp. It just isn't the same as series 1 and for that reason I dislike series 2. Luke nice box of series 2 you got there! I AM THINKING OF GETTING A BOX OF THIS.NOT A HUG FA OF THE ROOKIE MATERIELS DESIGNG. I really like Upper Deck Series 2. The YG's this year are not that good though. They normally have a better YG crop. I love how they included Opee Chee and MVP updates in Series 2. I love the extra Rookies and the added stuff to the product this year. They left out many great rookies from the Rookie Materials set this year which was pretty disappointing. Still, I believe Upper Deck Series 2 is a great product. i really like how you told me more about hockey cards than i already knew i really like your cards in the break but the sequin is my favourite because I'm a boston fan zoo hope I get picked thx!!!! thanks for sharing, yea, definitely the cards are different. there is not rally a smaller 'hi series' anymore. but upper deck put updates to mvp, victory, and opc because they couldn't make those types of sets once panini came into the market.